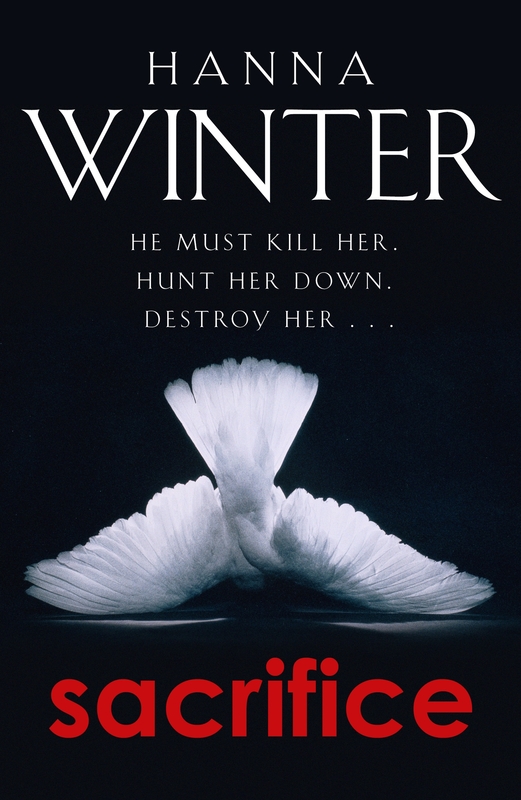 I’d like to welcome Hanna Winter, the author of Sacrifice, to the blog today to talk about the fascinating subject of pen names. One of the more common questions about me and my writing career, is why I publish my work using different pseudonyms, Hanna Winter and Eva Sternberg. The answer is quite simple: I don’t want to limit myself to a single genre. The dark depravities of the human mind have always held a deep fascination for me, and writing my sinister murder mysteries will always be my passion. That’s what Hanna Winter stands for, dark and morbid thrill rides. But I don’t want to miss out on the chance to stretch my literary wings into other genres, and I enjoy every minute I spend as my alter ego Eva Sternberg, writing upbeat, fast-paced “chicklits”, putting a smile on “her” readers’ faces. It’s a conscious decision, too. Alternating between my literary personas not only puts me in the right “frame of mind” for the type of story I am creating, it also provides a most welcome emotional counterpoint. Devoting myself to a more “sunny” genre as Eva Sternberg after finishing one of my thriller manuscripts, helps to cleanse the months of gloom and darkness that Hanna Winter had to wade through in order to put the expected fright into “her” readers’. But to be honest, my different pen names are probably more of a service to the readers, both first timers and longtime fans alike. As flexible as the author may be, his or her readers want to know what to expect when they pick up one of their books. In the minds of the audience, an author’s name often becomes synonymous with a certain genre. Just imagine you’re a fan of cleverly insidious crime fiction, looking for your next fix of John Grisham or Ian Rankin from the shelves of your favorite bookstore, only to discover that your author of choice this time chose to try himself at a deeply romantic love story. Similarly, a Nicholas Sparks devotee might even feel “robbed”, if he was unexpectedly forced to go through chapter after chapter of blood, guts, murder and violence – no matter the quality, there’s bound to be some disappointment. In the early stages of my rather bifurcated writing career, I was determined to keep my author’s “double life” a secret. I will admit, I was a bit worried how my readers might react, the genres and their respective fan bases as different as they are. So I always appeared for interviews or readings using the “appropriate” pseudonym, and made a note of only ever being addressed accordingly, keeping both of my personas strictly separate. I even went as far as having them included on my passports, one for each. These days, I don’t mind that much, anymore. I’ve grown to embrace it, rather than shy away from it. But I will continue to use my different pen names for my work, of course. No sense in creating unnecessary confusion. Hanna Winter is (as we’ve just found out!) the pseudonym for Eva Rehberger who is a hugely successful catwalk and fashion model in her native Germany. Hanna Winter’s first thriller, THE CHILDREN’S TRAIL (2010), became an instant bestseller and Sacrifice has sold over 30,000 copies in Germany since first publication in 2012 – this is the first time it’s been available in English. We have just published the eBook of Sacrifice and the paperback is due to be published on the 17th November 2016. The former German model has since published six novels under several pen names. Sacrifice has been received with critical acclaim. He must kill her. Hunt her down. Destroy her . . . 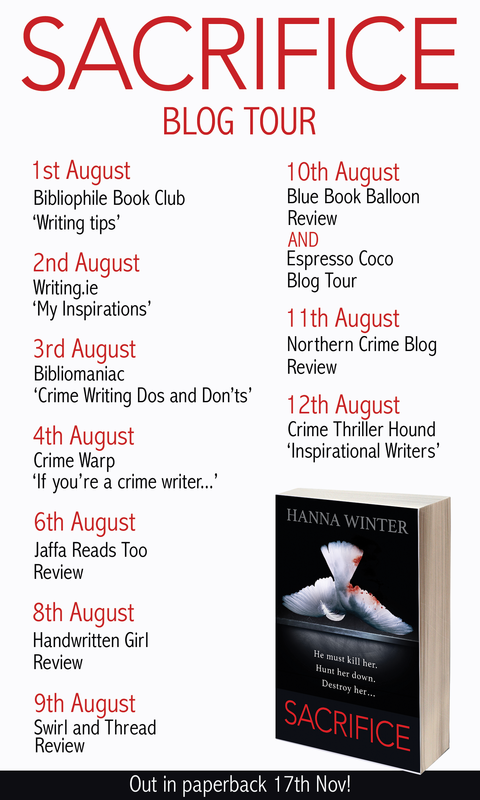 Thanks to Emily at Bonnier Zaffre Books (find them on twitter at @BonnierZaffre) for organising the blog tour.